Derek Stepan was Team USA's leading scorer in its run to the 2010 World Junior gold medal and was the first Rangers prospect to lead the entire tournament in scoring since Doug Weight in 1991. New York Rangers President and General Manager Glen Sather announced today that the club has agreed to terms with forward Derek Stepan. Stepan, 20, served as Captain of Team USA at the 2010 World Junior Championship, leading the United States to just their second Gold Medal (2004) in the elite tournament. He led all skaters in assists and points en route to being named to the tournament All-Star Team, as selected by the media. Stepan finished the tournament with four goals and 10 assists for 14 points in seven games. This season, Stepan registered 12 goals and 42 assists for 54 points, along with eight penalty minutes in 41 games with the University of Wisconsin Badgers of the Western Collegiate Hockey Association (WCHA). He established career-highs in games played, goals, assists, points and penalty minutes. Stepan ranked among the NCAA leaders in several scoring categories, finishing tied for first in the nation in assists and ranked second in points. He also led the WCHA in points, assists and power play assists (22), and tied for fifth in power play points (23). The second-year player led his team in assists and points, tied for third in game-winning goals (three) and seventh in goals while surpassing the 40-assist and 50-point marks for the first time in his collegiate career. Stepan, who was ranked 16th overall among NHL prospects by The Hockey News on their 2010 Future Watch list, registered six points (two goals and four assists) in the NCAA Tournament, including a four-point performance (two goals and two assists) and the game-winning goal in the National Semifinal contest vs. R.I.T. on April 8, to lead Wisconsin to the National Championship game. He finished the season with 15 multi-point performances, including a career-high, five-point effort on November 27 at Michigan State (one goal and four assists). Stepan also recorded a season-high, five-game point streak from November 21 at St. Cloud State to December 5 vs. Michigan Tech, tallying 12 points (two goals and 10 assists) over the span. Known for his remarkable play-making ability, Derek Stepan has been very impressive at the current Rangers Development Camp for prospects, where he has set up multiple goals by Evgeny Grachev. Stepan was named WCHA Player of the Week for the period ending November 29, registering six points (two goals and four assists) in two games during the stretch. The 6-0, 190-pounder skated in 81 career NCAA games over two seasons with Wisconsin, recording 21 goals and 66 assists for 87 points, along with 14 penalty minutes. In 2008-09, he led all Wisconsin Freshmen in goals (nine), assists (24) and points (33), while finishing second on the team overall in points and assists, and tied for sixth in goals. He tallied his first career point with an assist in his collegiate debut on October 10, 2008 at Boston College. 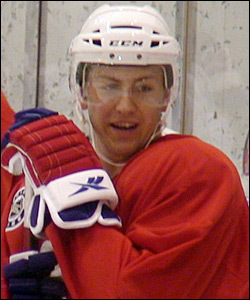 Prior to his collegiate career, Stepan skated for two seasons with Shattuck St. Mary’s prep (HS-MN), capturing back-to-back USA Tier I U-18 National Championships in 2007 and 2008. He led the team’s title run as a Senior in 2008, registering a team-high six goals and 13 points in six tournament contests, including a hat trick on April 3, 2008 vs. Amherst. Stepan established career-highs in goals (44), assists (67) and points (111) that season. He led the team in assists and points, and tied for the team lead in goals. The Hastings, Minnesota native was originally the Rangers second round choice, 51st overall, in the 2008 NHL Entry Draft. His father, Brad, was also drafted by the Blueshirts as a fifth round choice, 91st overall, in 1985.